The 1.2 m InfraRed Telescope at Mount Abu is the first major facility in India specifically designed for ground based infrared observations of celestial objects. 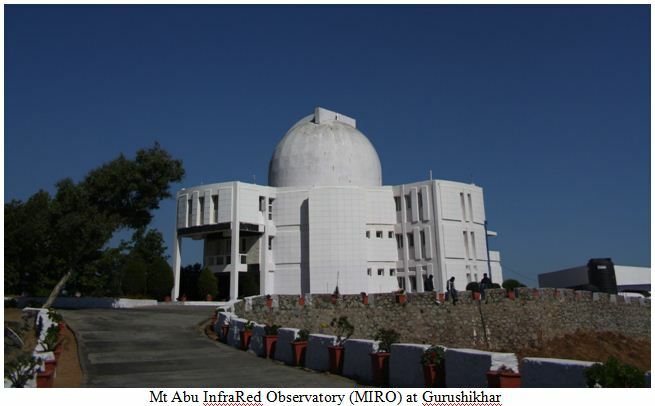 This Infrared Observatory is situated at an altitude of 1680 meters above mean sea level on top of the Gurushikhar peak of Aravali range, in Mount Abu, a hill resort in Rajasthan, India. The 1.2m telescope was installed in the early '90s by the Physical Research Laboratory (PRL), Ahmedabad and funded by the Department of Space, Government of India. Apart from 1.2m Cassegrain f/13 telescope, optimised for infrared and optical observations it houses 0.5m CDK telescope for variability studies. The telescope has a host of back-end instruments, such as 1kx1k & 2kx2k CCDs, Near Infrared Spectrographs (NICMOS-III and NICS), optical polarimeter, PARAS- spectrograph for radial velocity measurements (for exo-planet hunting program) and Fabry-Perot spectrograph. MIRO has its own aluminisation plant for mirror coating, liquid Nitrogen plant to supply liquefied nitrogen to cool astronomical detectors and a small mechanical workshop. The observatory campus also houses an atmospheric and space science laboratory to perform studies related to aerosols and other atmospheric physics experiments. The idea of setting up an optical and IR observatory and initiating the infrared and optical astronomy programme was put forth by PRL during the 1970s. After a suitable astronomical site survey of several locations, Gurushikhar, the highest peak of Aravali range in Mt Abu, Rajasthan, was found most appropriate due to its low water vapour, more than 220 observable nights with reasonably good seeing and the site's vicinity to PRL (240 kms). The responsibility of developing the site, including the construction of the access road, telescope building and other facilities, telescope mount and dome, etc., was given to ISRO. The whole observatory was designed and developed indigenously. The design of telescope drives, mount and other support systems, including telescope control, was taken up by the SHAR Centre which also supervised the fabrication work at Chennai. The mirror fabrication, polishing and other optics was the responsibility of the Indian Institute of Astrophysics, Bangalore. All the back-end instruments, one of the most important components of the astronomical observations, were developed in parallel with the setting up of the observatory. It may be worth noting that some of those initial instruments are still functioning and competing with new generation instruments. The “first Light” image of star alpha Arietis was acquired with the 1.2 m telescope on November 19, 1994 establishing excellent quality of its optics. The observatory started regular operation immediately with the lunar occultation study of IRC-10557 (v Aquarii) on December 7, 1994. Over the years, it has catered to the observational requirements of the scientific programs of the Astronomy and Astrophysics faculty. The research programs cover a wide range of objects and events, such as star formation, stellar structure and evolution, comets, Novae and binary systems, supernovae, lunar occultation studies and starburst and active galactic nuclei. The techniques used are imaging photometry, spectroscopy and polarimetry. Astronomical data obtained from the observations made from the MIRO have resulted in more than 150 peer reviewed research publications as of now. This is a significant achievement considering rather modest astronomical facilities at the MIRO. The Observatory is in the process of acquiring a larger, 2.5 m telescope which is supposed to give a big boost to its scientific programmes. Study of nearest and brightest supernova in M 82: Supernova 2014J was the brightest and closest Type 1a in the last four decades. Supernova is an explosive event, the brightness of which surpasses the whole galaxy. It can happen when either a massive star runs out of fuel or when a compact object accretesa a large amount of mass from surroundings leading to thermonuclear explosion. 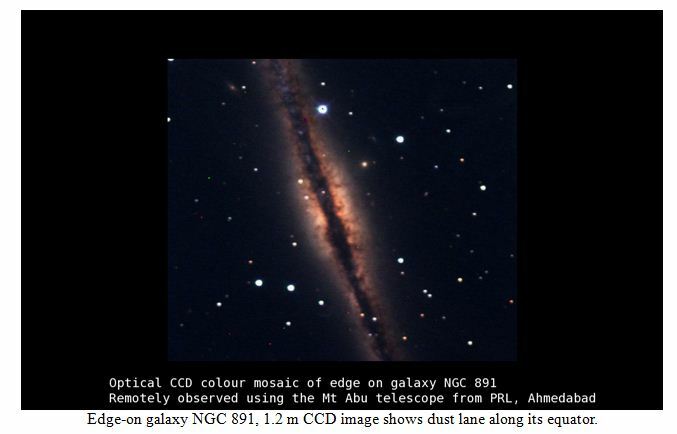 SN2014J was studied extensively from Mount Abu both spectroscopically and photometrically. Given its proximity, it offered the best opportunity to date to study a thermonuclear supernova (SN) over a wide range of the electromagnetic spectrum. Optical/IR observations of the rising light curve show that SN 2014J was a spectroscopically normal Type Ia supernova (SN Ia), albeit exhibiting high-velocity features in its spectrum and heavily reddened by the dust in the host galaxy. Seventeen optical and 23 NIR spectra were obtained from 10 days before (-10 d) to 10 days after (+10 d) the time of maximum B-band brightness. Carbon is not detected in the optical spectra, but C I 1.0693 micron in the NIR spectra is identified. The spectra of SN 2014J show that it is a normal SN Ia, but many parameters are near the boundaries between normal and high-velocity subclasses. Identification and classification of an astronomical source as LBL blazar: Blazars, a sub-class of active galactic nuclei, are one of the brightest sources in the universe. These are highly variable and have variable optical polarisation. 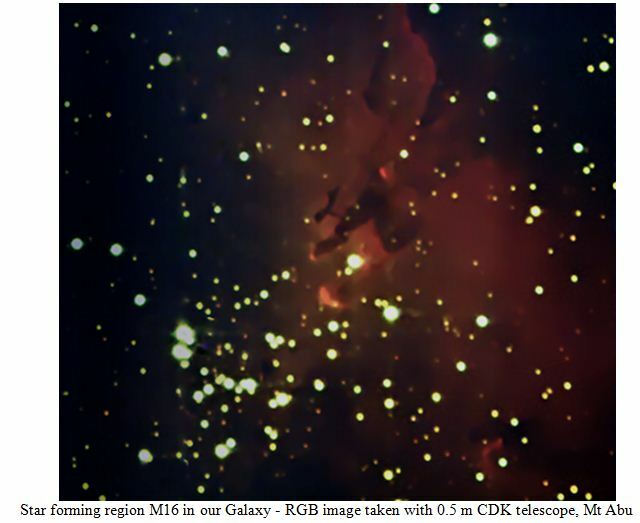 One such source, CGRaBS J0211+1050 was detected by space borne observatory Fermi in Gamma-ray. Polarimetric observations carried out at Mt. Abu Observatory detected high and variable optical polarisation in this source and classified it as a possible low energy peaked blazar (LBL). It was later confirmed as an LBL using multi-wavelength data from Mt. Abu and other facilities. The study led to the estimation of the size of the optical emission region, mass of the black hole and underlying magnetic field in the source. Several other interesting and important results have been obtained on a large number of astronomical sources using the observations from MIRO. A new programme of detecting and characterising planets in the stellar systems beyond our solar system is going on using radial velocity measurement technique. The 1.2 m telescope is in very good health to serve the community for many more years to come. In addition to 1.2 m telescope, 0.5 m CDK telescope also has started functioning in automated mode which is an essential requirement for the continuous monitoring of variable sources, such a blazars. The upcoming new 2.5 m telescope will further strengthen the capability of the MIRO. With the successful commissioning of all the payloads onboard ASTROSAT, Indian community can now boast of a wonderful multi-wavelength platform, right from radio (GMRT and ORT of TIFR) to high energy gamma-rays (HAGAR of TIFR and TACTIC of BARC) to explore the enigmatic universe.